Have you heard about Doga classes being held in your neighborhood? Are you intrigued by what it is all about and what are the benefits of such sessions? New yoga form—known as Doga—became popular in last few years. Doga is yoga with your companion pet that helps you connect with your pooch at a deeper level. Doga benefits both the dog and the dog-owner. Doga has meditative effects that calm your nerves and the dog’s anxious behaviors. Doga is not about fidos imitating your exact poses, but a sense of companionship to provide an extra motivation for you to continue the classes. However, not all pooches are interested entirely, so it’s better to develop positive associations in the Fido’s mind to make his routine. Yoga with the dog is simply a fun-filled exercise that strengthens the bond between you and your dog. When both of you are involved in a single relaxing activity, the dog feels important and loved, so his anxiety fades away. The exercise makes you mindful of the dog’s body language and, similarly, increases the dog’s focus on your commands. The dogs relax as the soft music fills up the surrounding space. Moreover, dogs are interested in the pet-massage they get during the session. Dog’s love to gain your attention will act as a trigger to leave behind unwanted behaviors. You will find him behave more calmly and listen to your commands more attentively as his focus will be enhanced. Beware of dog poops during the class, especially, if he is suffering from stomach problem. Take the poop bags and pooper scooper to clean up after your dog. The mindfulness exercise develops a feeling of connectedness in both the yogi and dogi. It relaxes the muscles via stretches, and both parties involved feel exhausted yet relaxed. Deep breathing and relaxing stretches are the crux of Doga sessions. Doga is based on the model of meditating with a close partner to help reduce the sense of solitude. It assists in relaxing dog and you mentally as well as physically. The meditation together develops awareness in you about the dog’s behavior. It will help you maintain a patient behavior towards the little furball. As the dog parks create an opportunity for you to socialize with people, doga class will provide you a chance to meet more self-aware and mindful people. If you are not fond of the extroverts, at doga class, you will encounter many introverts or I would say, like-minded people. Dog parks do not necessarily have well-trained and well-behaved dogs, but doga class is the right place to socialize, for your four-legged. Your pooch may find some well-behaved ‘poochy furrends’ at the doga class. Your dog will remind you daily to visit the yoga class so they can meet some good ‘furrends.’ It might help the pooch improve his behavior by imitating other dogs. The stretches will not just relax your muscles but also exhaust the pooch too. If you have an obese one, doga class will burn the extra calories without him knowing it and getting hungry too often. If you want a substitute for daily long walks, join doga classes to enjoy greater benefits. With increased blood circulation, the dog begins to feel calmer and abandon destructive behaviors. Additionally, daily dog massage will strengthen the bones to prevent injuries, early onset of arthritis, or hip dysplasia. 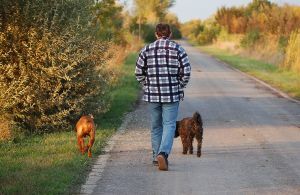 If the dog has survived a trauma recently, the mind-full exercise will ease the pain and strengthen the muscles again. In an attempt to imitate you, you will find the pooch making funny poses that will entertain you throughout the class. Their curious spirit is a great distraction from your stress. The dog enjoys the equal fun at the class because he gets to meet and play with his ‘furrends.’ They get entertained by the playtime they get between sessions. – Fiona Appleton is a Labrador owner. She is the manager of ultimatehomelife.com which has been developed to help people solve the troubles of pet ownership. She is an active advocate of animal protection campaigns. She wants people to understand that dog-behavior is reflective of our behavior. This entry was posted in Guest Posts and tagged Dog, DOGA, Healthy, Sessions, Yoga by Len Saunders. Bookmark the permalink.